So with another weekend of racing in the books it is time for a blog entry. 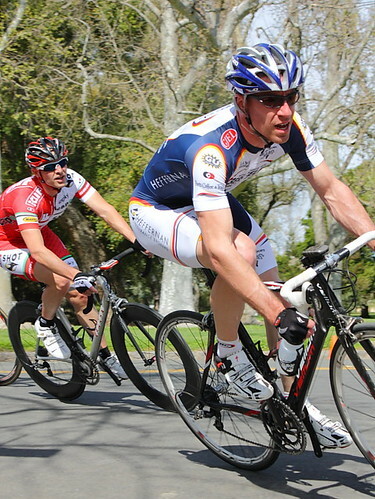 This weekend was the Sac golden wheelmen's races Bariani and Land Park. This was my first master's race and I did not enjoy it, no aggression. I know a lack of aggression sounds like a good thing but in this instance it isn't. The course is mostly flat with a couple rollers but nothing large enough to break up the very large 100 rider field. Typically at this race there is rippin winds that turn it into a gutter-fest and break the group into a couple small packs. Zero wind this day though. We had 5 guys in the race and all took turns trying to get off the front but each time several guys would make the effort to get to you/go with you but that was all. They would just look around slightly out of place wondering what was going on. No aggression to make something work. The race was single lane most of the way and in the pack people were twitchy and sketchy. It came down to a sprint and a couple crashes, no bueno. same as always, take turns attacking till a break goes then cover. JD got in the break that stuck and the rest kept it take way. He didn't get much help and got worked over in the end. repeat after an hour break. This is more like it. Flyers galore, strung out and pushing it. Again, keep attacking till someone gets off the front, this time it was Joe along with Rand from Webcor(Other large team there) so the make up was good and time to cover. Sad news was Gerlach going down in a crash and taken to the hospital with a punctured lung(from his FB page). Joe ended up taking second in the sprint.